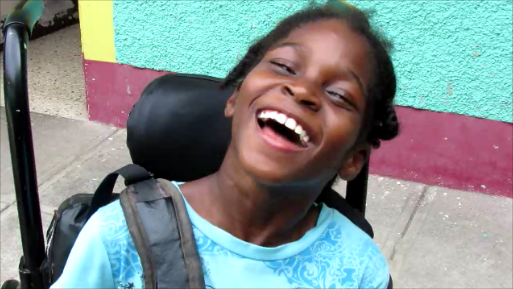 Thanks to Yasanya's therapy and schooling she has made huge strides with her language. Yasanya arrived at MSC in 2013 when she was 7 years old. Having cerebral palsy has made it challenging for her to use her speech and fine motor skills. However, the challenges have hardly held her back from making great progress in these areas. Yasanya is a keen student who attends school regularly and with enthusiasm. Her biggest accomplishment continues to be her language development. She now speaks in sentences and answers questions appropriately. Fer favourite subject is math as she enjoys counting and is able to do simple addition with manipulatives. Yasanya embraces life with a smile and is always the first to volunteer for any task. She is a very social child and enjoys greeting everyone with a big smile, calling them by name, and asking how they are. She plans to continue increasing the complexity of her language skills as well as working on her various motor skills.